In the 21st century, ties really serve no purpose other than covering up the buttons on our shirts, but for some reason we're still made to don these neck strangling accessories. 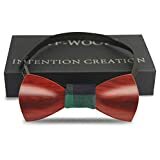 Well, when you wear this cool new Wooden Tie, you'll not only be taking a stand against the oppressive world of men's formal fashion, but you'll be making a personal statement that although you may be forced to wear one, it won't be made from unmanly patterned silks and goofy striped fabrics. This no-nonsense wooden necktie is made from actual redwood beams, reclaimed from salvage yards in the San Francisco area, that are cut, sanded and varnished, leaving a natural grain and coloring on display. Each individual wooden panel is then connected with an adjustable hidden elastic cord, which slips easily around the shirt collar. Even better, it's much easier to keep clean after you accidentally dunk it into your morning coffee.